Having a new boiler installed is not a decision that is taken lightly and we know that more often than not you need to make the decision when it is least expected, so at B2B Heating we have tailored our boiler installation process to make it the most efficient and stress-free experience possible. We are dedicated to ensuring that all of our pricing is competitive right across the market, meaning that you can be sure that you are getting the best quality products and services for the best price around, in the majority of cases we are considerably cheaper than the larger national heating specialists and we continue to monitor our prices. We only use the leading names in new boilers for all of our installations, ensuring that you are getting the most energy efficient boiler installed and ready to help you save as much as 35% off your energy bills. Our boiler installations are always carried out by Gas Safe qualified engineers and are tailored to your needs, making sure that you get the right boiler at the best price.We are Accredited by all leading boiler manufacturers. 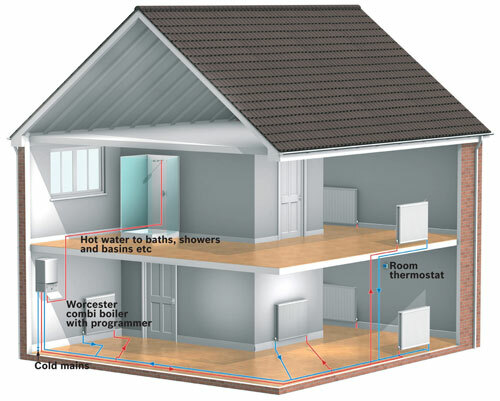 A system boiler heats your central heating system directly and produces hot water for your cylinder.A system boiler, just like a regular (conventional) boiler works on the principle of stored hot water. However, a system boiler differs from a regular boiler in some important respects. Firstly, many of the major individual components of the heating and hot water system are built into a system boiler, which means that installation is quicker, neater, easier and more efficient. Secondly, the hot water is pumped from the system boiler through the heating system to the radiators and hot water cylinder, resulting in a fast response and more economical running costs. The system boiler removes the need for a feed and expansion cistern. Regular boilers (also known as ‘conventional’ boilers) heat your central heating system directly and produce hot water for your cylinder. If you are replacing an older model of boiler, the chances are that you will have a regular (also known as ‘conventional’) boiler. 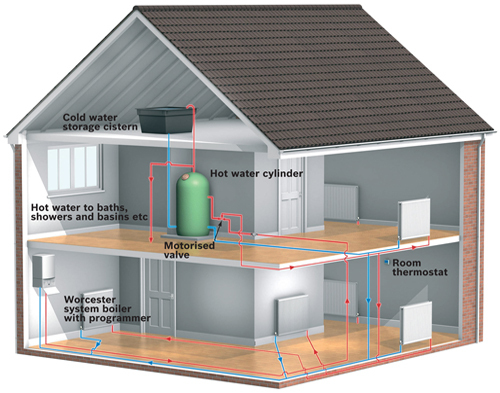 A typical regular boiler system incorporates a boiler, extended controls, a hot water cylinder which is often fed by a cold water storage cistern located in the loft and a feed and expansion cistern – also located in the loft.